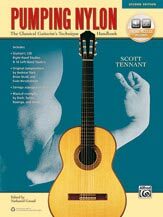 Upon its first publication in 1995, Pumping Nylon became an instant classic and must-have technique handbook for all classical guitarists, and many players of other styles as well. Scott Tennant's encouraging style, sense of humor, and unique approach to technical training have garnered Pumping Nylon devotees throughout the world. At the heart of it all is the famous "Daily Warm-Up Routine," which includes 11 clever, helpful exercises to get both hands in shape and ready to play while improving your technical skills. The invaluable lessons in technique are supplemented by Giuliani's 120 Right-Hand Studies, Tarrega arpeggio studies, and examples from music by Bach, Turina, and Rodrigo. In addition, original compositions by guitar luminaries Brian Head and Andrew York reinforce the material while also providing concert-worthy repertoire. This new, improved second edition of Pumping Nylon incorporates even more great material, with new pieces by Evan Hirschelman, Guiliani's Left Hand Etudes, Op. 1, and new technical exercises in tremolo and balancing chord voicings. The music engravings have been improved for easier reading, and all of the media is available online. If Pumping Nylon is already part of your library, it's time for an upgrade! Q: Hello, this book is in paperback or spiral-bound ? I would like spiral. The current stock have a plastic spiral binding.